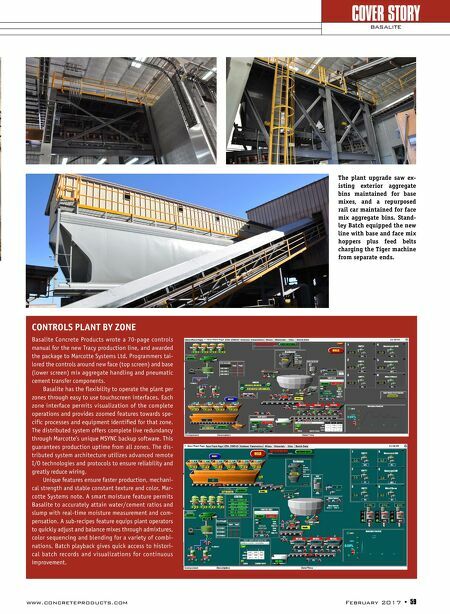 58 • February 2017 www.concreteproducts.com TRACY AT TWENTY Basalite Concrete Products serves northern California, the Central Valley and northern Nevada from Tracy, Dixon, Carson City, and Selma plants. Based in Dixon, near the San Francisco Bay, it is one of the top private con- crete masonry producers west of the Missis- sippi River, running nine block or hardscape unit plants in five states and Canada. During an expansion phase timed with the addition of bagged products in California and Wash- ington, it acquired the Tracy plant in 1997 from Hokanson Block. A single building at the 22-acre site housed the initial three-at- a-time block machine, and was soon joined by a second and third structure for two pack- aged-concrete product lines and a big board paver machine. Located about one hour inland of the Bay Area, the Tracy site now has 1) the main production line, where the Tiger PS-1400 HD runs primarily paving stone and slab units; 2) a smaller block and segmental retaining wall unit line run- ning on a Besser Dynapac in its third tour of Basalite duty, following stops at the Napa and Dixon plants; and, 3) a Sakrete and private label bagging line. At peak demand, Tracy dispatches well over 100 truckloads daily to South Bay Area and Cal- ifornia Central Valley and Sacramento mar- kets. The latter were among the hardest hit nationwide during the housing crisis, but have recently rebounded. Tracy plant output is about two-thirds the volume of the Dix- on headquarters operation, whose principal focus is the North Bay Area and Sacramento. Tracy has become a bedroom communi- ty for Silicon Valley and San Francisco, two of the country's priciest housing markets. Along with residential development, the surrounding San Joaquin County is attract- ing distribution and logistics operations for brands no less than Amazon, Home Depot and W.W. Grainger. Residential and commercial building market improvement outside the Bay Area and Silicon Valley drove Basalite's 2014 deci- sion to move the Tracy plant beyond its first generation paving stone workhorse. Man- agement opted to deploy the largest Tiger machine in North America, recognizing that a 280-mm board length increase could afford an extra row of standard size product com- pared to a traditional 1,100- x 1,400-mm board machine, and efficiently mold larger slabs the market was demanding. Along with the new machine, 480-pallet buffer zone and dry side infrastructure—all from Pathfinder Systems—the 2016 plant upgrade saw the erection of inordinately robust, seismic code-worthy steel supports for new base and face mix hoppers; localizing of all safety devices, primarily with trapped key interlocks; and, a switch from wood to Wasa Uniplast plastic pallets, each marked for integrity testing at scheduled intervals. An existing kiln with 12 bays, each holding 360 pallets, continues to serve the main Tra- cy production line. "Basalite Concrete Products takes tre- mendous pride in being an industry leader," notes Vice President California/Nevada Dale Puskas. "The recent investments that we've made in the Tracy facility, in both the pav- er plant equipment replacement project and our quality assurance program through plant certification, demonstrate deep commitment to the Masonry and Hardscapes industry. These moves will position us well for further innovation and growth in the Northern Cali- fornia market." 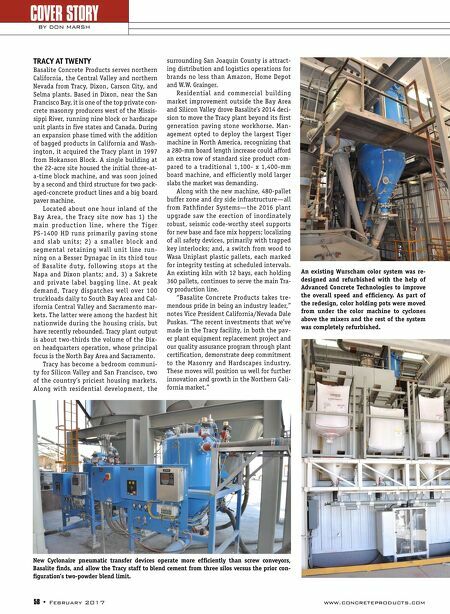 COVER STORY BY DON MARSH An existing Wurscham color system was re- designed and refurbished with the help of Advanced Concrete Technologies to improve the overall speed and efficiency. As part of the redesign, color holding pots were moved from under the color machine to cyclones above the mixers and the rest of the system was completely refurbished. New Cyclonaire pneumatic transfer devices operate more efficiently than screw conveyors, Basalite finds, and allow the Tracy staff to blend cement from three silos versus the prior con- figuration's two-powder blend limit.